The Fulmer Cup competition for 2008 ends tonight at midnight, and barring any West Virginia triple murders, Missouri drug busts, or the FBI unearthing a sleeper cell at Michigan, (Buckeye fan: “I knew it!”) this cat is skinned, and its coat is crimson and white. Um, actually, so is the cat, now that we’ve gotten the hide off and everything. What the hell are we supposed to do with this thing? It is pissed. Congratulations are due to your winner, with a total of 28 points. Some people would say congratulations to someone who just won such a prestigious award. For such an occasion as this, we won’t just crack out the standard Asti Spumante—no, only the Andre Cold Duck Pink will do, and only if we have buckets and buckets of it. Pop the cork, take a bow, and let the celebrations begin: a champion arriveth. 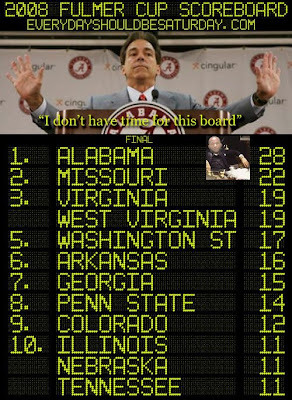 Congratulations to Alabama on their 72nd national title, which Nick Saban appropriately does not have time to accept in person. Roll, Tide, Roll. Jimmy Johns must be noted for his outstanding work in making this happen, selling cocaine an incomprehensible number of times to undercover cops in Tuscaloosa, but he wasn’t alone. Jeremy Elder, while not particularly good at robbery, was certainly enthusiastic enough to rack up points for two counts of first-degree robbery. Johns and Elder alone would have won the Copa del Malfeasance, but teammate A.J. Walker kicked in by walking around drunk on the strip. But we’ve done that, you say! Of course you have, and if you are currently on the roster of the Crimson Tide, we invite you to submit your points to be tallied with the rest. This leaves the Ellis T. Jones Award for Outstanding individual Achievement In A Single Crime, which this year must also be awarded to Johns, who racked up twenty points for having the persistence to sell cocaine to undercover officers not once, but FIVE times. That kind of stick-to-it-iveness gets you championships. And lengthy jail sentences. Our petitions for an award ceremony rebuffed, we had to rely on hidden camera footage take of Nick Saban at home to get any reaction from the most powerful coach in sport. From appearances, the Fulmer Cup is just one more piece of motivation to put on your wall. Thus concludes the Fulmer Cup 2008. Amen, alleluia, and hosannas all around. Special thanks to Brian, who remains hung like Reggie F’n Nelson, for the scoreboards, to Dave, who never neglected to let us know of the smallest parking violation, and SAS Wiki, whose Fulmer Cup Accounting Station was an immense resource for someone as mathematically challenged as the editors of this site. You’re all coming to extra-crispy hell with us.